An “F-cell” prototype is being delivered by a remote drone. The cell has wireless backhaul and wireless (solar) power. The technology was demonstrated at a Nokia meeting in Sunnyvale, CA on September 22, 2016. I recently learned a very interesting fact about the drone used in the video above and I have to say, I feel a bit remiss that I didn’t post this earlier. So first a little bit about the technology in question. Nokia Bell Labs announces a breakthrough in small cell technology that offers greater flexibility, efficiency and optimized deployment economics to expedite the creation of the high capacity and low latency network that will form the digital fabric of the future for humans and machines. “F-Cell” technology eliminates the costly power and backhaul wires and fibers currently required for small cell installation to enable “drop and forget” small cell deployments anywhere. 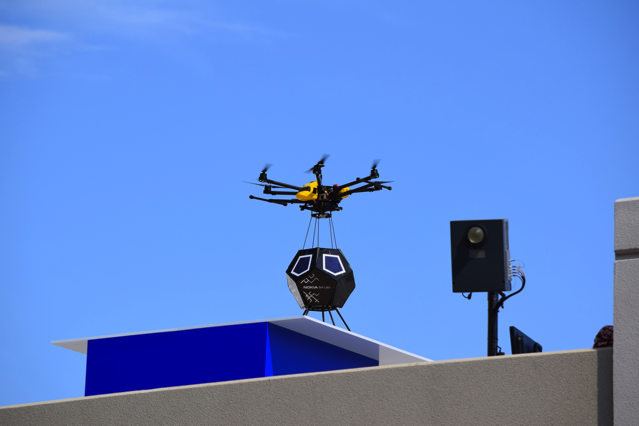 Drone Delivery of F-CellBell Labs recently demonstrated the world’s first drone-based delivery of an F-Cell to a Nokia office rooftop in Sunnyvale, CA. (captured in photo). The F-Cell wirelessly self-powered, self-configured and auto-connected to the network and instantly began to stream high-definition video. Now for the cool bit, the drone in the video was designed and built by our very own Michael Robbins, Director of Training, Drones and founder of Drone Universities. If you have been researching your options for drone training, then you safely stop now. When it came to reliable drone technology, Nokia knew the answer; when it comes to quality drone education, the answer is the same … Drone Universities. When Nokia needed drone expertise they came to Drone Universities. You have access to the same expertise through the Drone Universities drone training program. Bell Labs’ scientists have been recognized by many of the world’s most prestigious technology organizations for their contributions to society. Our researchers are continually expanding the capabilities of communications networks –optical, wireless, broadband access, cloud – with breakthrough technologies to make them faster, smarter and greener. 14 of our researchers have shared in 8 Nobel Prizes for discoveries ranging from the invention of the technologies that serve as the foundation for all information technology, to the nature of subatomic particles and the origins of the universe. And 4 of our scientists have been awarded the Japan Prize, including Dennis Ritchie and Kenneth Thompson for developing the UNIX® operating system.